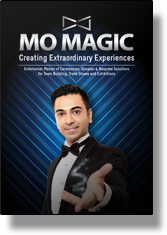 Mo Magic is available to enhance your event. Kindly consult his brochure of services, below, then take a few moments to complete his ONLINE BOOKING FORM. Download FULL BROCHURE OF SERVICES here. and when you see him in action, this is evident. He strives towards exceeding expectations and ensuring his clients and their valued guests are astonished, amazed and entertained. An electronic engineer by qualification, he discovered his passion for the art of magic whilst as an electronic engineering student at university and has been astonishing and entertaining audiences with magic ever since. In 2010, Mo Magic left his full time career as a project manager to pursue his passion for magic. He has a variety of corporate offerings, and entertains the public via TV shows and live theatre productions. 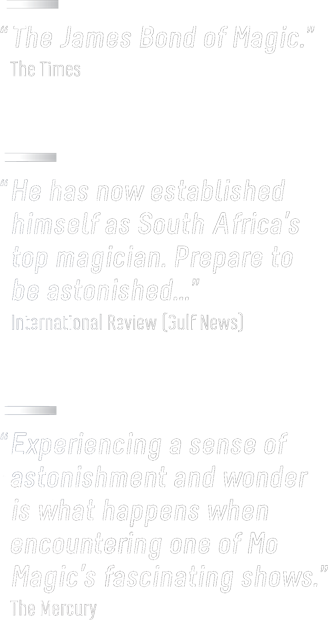 In 2017, Mo Magic was honoured as being the first South African magician to be featured as the cover story for the world’s largest magazine.